Innovation - Roska DBO Inc. Innovation is part of our core values and helps us succeed as a company. We succeed at innovation because we have imaginative, dedicated, energetic people for whom working at Roska means more than collecting a paycheque. They make a point of looking for operating or production challenges – sources of inefficiency or "pain" for the customer. Then they try to figure out ways to operate better, faster, cheaper or more safely – to the customer's benefit. Roska's management encourages its people to bring these ideas forward. Being a full-cycle provider, our different disciplines interact at the management level. This enables new ideas to be evaluated, refined and transformed into practical solutions. 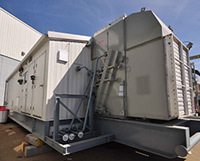 Each of our innovations has specific customer benefits – such as reduced field installation time. The Roska Method. This integrated project delivery approach combines Roska's unique people and equipment capabilities into a solution spanning the project's life-cycle, including operations and demobilization. The Roska Method delivers an array of customer advantages.